E-commerce refers to the buying and selling of goods or services online, as well as the transfer of money as part of these transactions, and is widely seen as one of the main engines of future growth in Cambodia’s burgeoning digital economy. As people across the Kingdom make better use of computers and smartphones in their daily lives, the opportunities for businesses are increasing, yet the regulatory situation in Cambodia remains undeveloped, so Geeks took a closer look. In a recent report on Cambodia’s digital economy, the World Bank Group acknowledges that after decades of incredible economic growth, low digital adoption means the Kingdom faces major obstacles on its journey to become a digital economy. “Fewer than one-quarter of businesses had a web presence in 2017, well below the world median of 46 percent… In addition, the limited uptake of digital financial services, lack of IT skills, and incomplete legal framework are likely to constrain the development of Cambodia’s digital economy,” the report warns. Yet the digital economy is growing to meet the demands of an increasingly tech savvy, and financially secure population. Since launching in 2015, online travel booking portal BookMeBus has played an important role in growing e-commerce in Cambodia. Such was the early demand that the site broke even in their fourth month of operations. However, challenging long running systems and practices has proven an ongoing task, explained CEO and founder Chea Langda. In an email, he explained that necessary skills were still lacking in the Kingdom, and the dearth of targeted Research and Development efforts is keeping e-commerce platforms from fully winning over a Cambodian market long-set in its traditional offline and cash-based ways. Chris McCarthy, Chairman of EuroCham’s ICT Committee. The Cambodian government is working to address the lack of any legal framework to support e-commerce in Cambodia, with the long-awaited legislation expected later in 2019, explained Chris McCarthy, Chairman of the ICT Committee at EuroCham. EuroCham has been part of discussions with the Ministry of Commerce and the Ministry of Post and Telecommunications in the drafting of the much-needed e-commerce laws. As of the publication of this article, Cambodia remains the only country in ASEAN to not have finalised any legal frameworks on e-commerce. Cambodia’s slow adoption of regulatory laws has allowed a local ecosystem to flourish. A huge informal e-commerce market has sprung up across the country, with many entrepreneurial Cambodians running online shops on Facebook and Instagram, buying from mostly Chinese e-commerce sites and reselling in Cambodia. Last-mile delivery remains a challenge as well, with Cambodia’s limited postal service unprepared for door-to-door delivery. Chris noted that it remains unclear how Cambodia’s small e-commerce startups will fair once the legal framework is completed and the expected arrival of bigger regional players. “Often when these big companies come into a market, they take all the oxygen out of the room,” he warned. Leakhena Long, of Joonaak Delivery, one of Cambodia’s core e-commerce startups. For Leakhena Long, co-founder and COO at Joonaak Delivery, it is not a given that the arrival of big companies will instantly crush existing Cambodian e-commerce companies. For a start, Cambodia’s digital usage is still very limited, with smartphone’s often used for little more than browsing social media. “People only use Facebook, they don’t go to conventional websites, so when you ask them if they use the internet and they say yes, they are actually just on Facebook. Even when searching for something they use Facebook instead of Google,” Leakhena explained. This explains the success of social selling in Cambodia, which has bypassed the more traditional e-commerce platforms popular elsewhere in ASEAN. “People see something on their Facebook feed, they like it, then they just buy it,” she noted, with cash-on-delivery still vastly more popular than transfer and cashless options like Wing or Pi Pay. A report for Asia Development Bank’s Mekong Business Initiative found that the main reason for this reluctance to adopt new payment options was a lack of trust. “Even Cambodians who get paid electronically immediately take all their money out of their account. They prefer to keep their cash at home. Cambodians need education to understand the value of leaving money in a bank or other financial institution,” the report stated. Low financial literacy amongst Cambodians and the focus of many startups and companies on Phnom Penh have contributed to limiting the full digitalisation of e-commerce in Cambodia. “E-commerce is supposed to be buying something online and the product coming to my house a day or two later, but it’s not like this here,” explained Joonaak’s Leakhena. Maxime Rosburger, a pioneer of Cambodia’s e-commerce scene. Maxime Rosburger is the founder of Meal Temple Group, the startup that operates food and grocery delivery platforms MealTemple.com and GroceryDelivery.Asia. Having founded the startup in 2013 when Cambodian e-commerce was in its infancy, Maxime has seen the ecosystem evolve and grow. “[In 2019] for the first time, we can say it’s booming. If we look at traditional e-commerce, I would say fashion is really booming,” Maxime said, highlighting the success of local clothing brands like Little Fashion and Zando, and the growth of ride hailing options like PassApp and Grab. “E-readiness is clearly really high in Phnom Penh,” he noted, although the rest of the country lags behind. Future development of the sector requires supportive trade laws to protect local startups, he stressed. It is clear then, that Cambodia’s e-commerce ecosystem is small, but the energy and vision among local entrepreneurs is helping its quick growth. As the Kingdom continues to explore digital solutions to a number of commercial situations and problems, it will be interesting to see how the market — and the government — responds; the e-commerce law promises to be especially interesting. 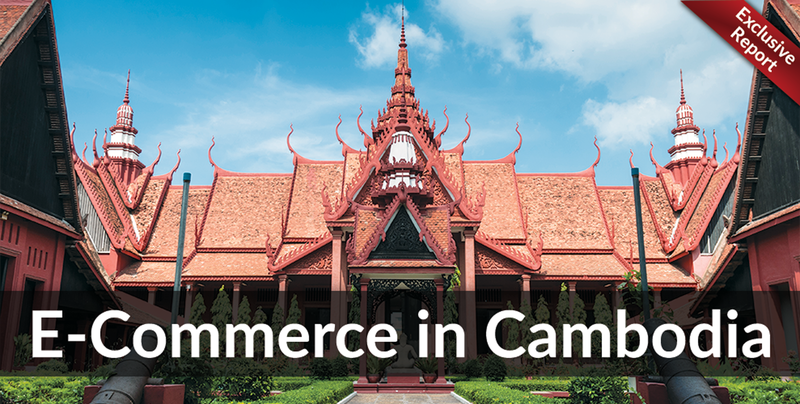 As always, Geeks in Cambodia will cover any developments, and lets see what 2019 holds for e-commerce in the Kingdom!